Traveling is one of my biggest passions, and many people can relate. It is exciting to see the world, meet the locals, and taste new cuisines. Although so many of us love traveling, there are certain countries people tend to travel to most. While these countries have merit, so many others are left mostly undiscovered. To bring some light to the places more people could visit, I’m starting a series called Undiscovered Countries. 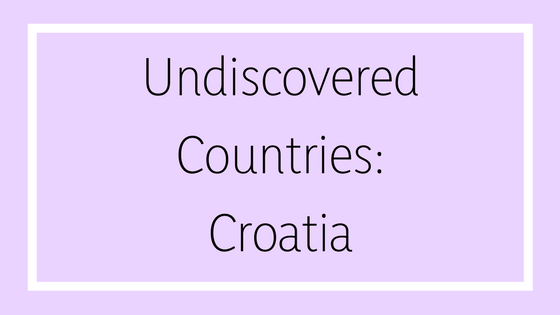 Today, I’m going to dive into what you should know if you are interested in visiting Croatia. Croatia is a swooping country, found on the coast of the Adriatic Sea, opposite Italy. It borders Slovenia, Hungary, Serbia, Montenegro, and Bosnia and Herzegovina. In Croatia, the national language is Croatian, while Serbian, Italian, French, and many other regional languages are minority languages. The currency is the Kuna, and 1 AUD equals roughly 4.61 Kuna. What can I do in Croatia? Croatia boasts over 1,000 islands, which many tourists love exploring. The Adriatic Sea is a great place for sailing, so all tourists should make a stop by the coast. The country also contains rich scenery, including seven UNESCO World Heritage sites. Of course, you can also visit the numerous small towns throughout the country, and make a stop in the capital, Zagreb. Here, you can visit farmers’ markets, spend an afternoon in a local coffee shop, or explore one of many museums. That sounds nice, but what about food? Black risotto (crni rizot) is often known in other countries as squid-ink risotto. It’s a Croatian specialty, and comes with several kinds of seafood mixed in. Make sure to eat this dish near the coast, as the seafood will be fresh. Manestra, a bean soup, is a common dish in Istria, and a must-try for foreigners. This soup contains a garlic-pancetta-parsley paste, as well as cured meats. It’s a unique flavor that you don’t often find, so make sure to keep it on your list. Rozata may seem familiar to those who love Central American cuisine. Rozata is Croatia’s version of flan, and it looks nearly identical. Still, there is no way you can go wrong with this sweet treat, so make sure to try it at least once. I’m sold. How do I get to Croatia? Flights directly to Croatia can be expensive, if you can even find them. Instead, consider flying into a major Western European city and taking a train or a short flight to Croatia. If you are hoping to stop in some other countries, this is a great way to make sure you do so. Once you arrive in Croatia you will never want to leave. There are tons of countries around the world, and most people will only see a handful in their lives. If you’re looking to break from that mold and adventure into new territory, why not start with Croatia?